Creative Partner and CEO Anthony J. DeMeglio has designed and managed Dinner In The Canyons for more than five years. This year, it was time for a makeover and he completely redesigned the event by using newer LED technology. By doing so, energy consumption was reduced by more than 300 amps, and we were able to provide a more dynamic design with the ability to change colors during the event. We accomplished this while still staying within the Agua Caliente Cultural Museum’s existing budget. We provided audio, lighting, video and project management. "The LEDs allowed me to create several looks for the museum and also allowed for creating amazing video looks without placing guests into pitch black while enjoying their meal." 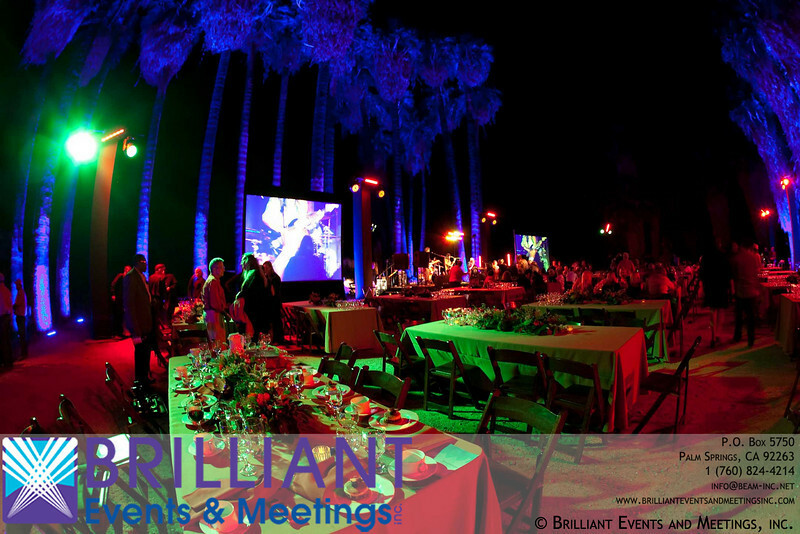 -Anthony J. DeMeglio, Creative Director and CEO, Brilliant Events and Meetings, Inc. (Photos © 2010 Raychelle Devilla Photography) Event Type: Fundraiser Approximate Guest Count: 400 Location: Indian Canyons: Andreas Canyons, Palm Springs, CA.